Survivor: Ghost Island (2018) - 19th place, 2nd out. Sent to Ghost Island once; cumulative time: In-game - 5 days; Ghost Island - 1 day. 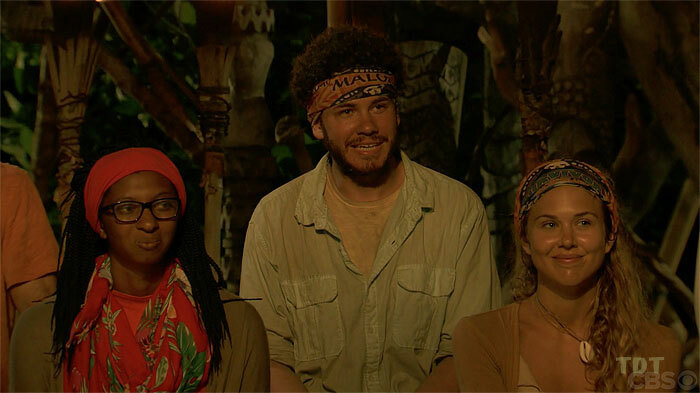 Voted out in Episode 2, "Can You Reverse the Curse?" (Day 6). Ghost Island Ep. 2 RC/IC: "Coming Up for Air" - Waits patiently to shoot baskets, never gets the chance; Malolo loses again. Ghost Island, Ep. 1: Won the (Game Changers) Legacy Advantage at Ghost Island, but was forced to give it to someone on the opposing tribe (chose Morgan). Ghost Island, Ep. 1: Five votes, from Brendan, James, Jenna, Laurel, and Stephanie (voted out, 5-2-1). We're the greatest tribe of all time! In small print: The advantage may technically not go to "you"
Erin Cebula at ET Canada (1/31/18): "Jacob Derwin Is Living a Dream"
Gordon Holmes at XfinityTV.com (2/9/18): "Jacob - 'I'm Worried They'll Think I'm an Evil Genius and Try to Get Rid of Me"
Josh Wigler at The Hollywood Reporter (2/12/18): "Meet Jacob Derwin"
Dalton Ross at EW.com (2/14/18): "Meet Jacob in 60 seconds"
Josh Wigler at The Hollywood Reporter (3/1/18): "First Two Eliminated Castaways Share Their Stories"
Gordon Holmes at XfinityTV.com (3/1/18): "Jacob - 'In My Efforts to Save Myself I Just Made the Target Bigger'"
Dalton Ross at EW.com (3/1/18): "Jacob Derwin on his 'lowest low of the game'"
Rob Cesternino at RHAP (3/1/18): "First & Second Exit Interviews"
Mike Bloom at Parade.com (3/1/18): "Jacob Derwin Goes from Shoeless to Booted"
"Hobbies: Songwriting and performing those songs, telling stories—be that on stage or just to friends—and cooking with my mom. Shut up, it makes me happy! Also, I listen to a ton of podcasts, attend as many concerts as I possibly can, and spend a great deal of time panicking over current political events. What's your personal claim to fame? Nothing feels better than hearing your own music for the millionth time and still enjoying it. And even better, when other people hear your music for the first time and it makes them cry. You can't fake those kinds of responses. It's the best. Cheesy? Maybe. True? You bet, man. If you could have three things on the island, what would they be and why? First would be my guitar because it gives me something I can focus on outside of the game. Next, one of those daily joke calendars because not only is it great for keeping track of time, but if your situation isn't providing many laughs, it's good to have a reliable way to find some. Finally, beard oil. I bought my first vile of this stuff about a year ago and it's the best feeling thing ever. Plus, it's really fun to respond to "Are you wearing cologne?" with "No, just beard oil." Which Survivor contestant are you most like? I've always felt like I related most to Stephen Fishbach, though I see a lot of David Wright in me as well. I'm a funny, nerdy, neurotic Jewish guy trying to make it in the entertainment business. I'm logical and smart (I like to think), but I've spent plenty of time crying in private. Why do you think you'll "survive" Survivor? This sounds stupid, but I'm really easy to talk to. I want to set up my situation so everyone knows they can come to me to chat and get support despite any problems they're having personally or socially in the game. I'm a teddy bear, y'know? On top of that, I'm not a weakling. I can haul firewood and follow instructions when it comes to building shelters. I know how to make fire and untie knots and all that."